Malik’s boxed-in circumstances certainly press ethical questions for the viewer, but in Rahim’s psychologically acute performance, Malik is never less than understandable—more often than not, he’s disturbingly sympathetic. 155 min. Sony Pictures Classics. Director: Jacques Audiard. Cast: Tahar Rahim, Niels Arestrup. A prophet is a sign of the times: past, present, and future. To hear him tell it, nineteen-year-old Malik El Djebena has no past to speak of, other than to profess his innocence on a charge of tussling with cops. Wisely, he’s more focused on the present concern of survival in prison as he serves a six-year sentence. And filmmaker Jacques Audiard suggests Malik is the future, an up-and-coming Arab lad who, though unwelcome, carves out a space in French society. 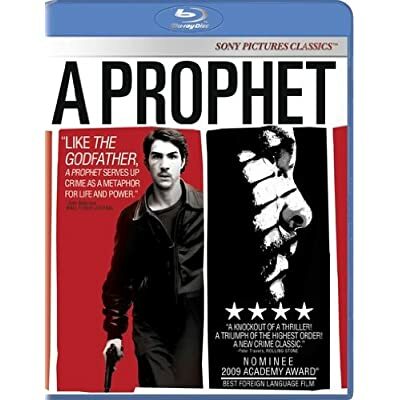 The French crime drama A Prophet also covers the spread from past to future, with its distinctive genre take and anointing of a new leading man in Tahar Rahim. Days into his sentence, Malik (Rahim) gets tangled up with the Corsican mobster who runs the joint. César Luciani (Niels Arestrup) is the go-to guy, even for knocking off soon-to-be-witnesses like Reyeb (Hichem Yacoubi). But since Reyeb is both wary and almost entirely inaccessible, César “recruits” Reyeb’s fellow Arab Malik with a do-or-die ultimatum: kill or be killed. The early turning point that is the death match of Malik and Reyeb will haunt the rest of the film, not least because of Reyeb’s lesson “The idea is to leave here a little smarter.” Ironically, the advice is offered by a man who will never leave to the man assigned to kill him. Still, Malik will take the lesson to heart. And Reyeb will take up residence—for quite some time—in Malik’s still-malleable psyche. Yes, Malik’s story is “an education,” for the young man and the audience (and despite the lack of Carey Mulligan, A Prophet is also up for a prominent Oscar: Best Foreign Language Film). The tension between Arabs and Corsicans palpably hits upon social discomfort in contemporary France, but Audiard’s film—co-scripted by the director, Thomas Bidegain, Abdel Raouf Dafri and Nicolas Peufaillit—focuses more on the gangster archetype of a naïf’s rise to power: sometimes clumsy, constantly threatened, and reliant on strategy and timing (of the biding and pouncing varieties). Audiard has called his film “the anti-Scarface,” presumably because of the overstatement and gangster-chic of that tale’s American tellings. Malik is all about flying under the radar, and his film’s aesthetic, though as nightmarish as Scarface, is grotty rather than gaudy. Malik’s boxed-in circumstances certainly press ethical questions for the viewer, but in Rahim’s psychologically acute performance, Malik is never less than understandable—more often than not, he’s disturbingly sympathetic. Quietly, Malik develops from someone whose only hope is to survive to someone who finds pride in his ability to thrive, albeit within a corrupt system. He knows he’s smarter than the next guy, more instinctive, built to last. Luciani’s role likewise gives Arestrup (who also appeared in Audiard’s The Beat That My Heart Skipped) an opportunity to play more than a stereotype: callous and a bit careless, César is a hurtful man, but he hasn’t lost the capacity to be hurt. The years-long negotiation of terms between César and Malik leads to a future only one of them was visionary enough to see. 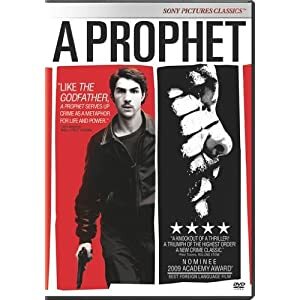 A Prophet is meant to look grainy, so that's part of the deal with Sony's excellent hi-def transfer, now available on Blu-ray and DVD. Trust Sony to deliver the best possible image, which on Blu-ray spells a highly detailed, beautifully textured picture with delicate color rendering, well-calibrated contrast, inky blacks and fine shadow detail. The lossless DTS-HD Master Audio 5.1 mix is likewise outstanding, excelling in clarity of dialogue and atmospheric ambience. The disc includes a subtitled commentary with director Jacques Audiard, actor Tahar Rahim, and co-writer Thomas Bidegain. The team gives good coverage of the development of the story and the contributions of the actors, as well as production detail, the musical score, and the film's themes, among other topics. Four "Deleted Scenes" (10:34 with "Play All" option, SD) take us a bit deeper into the story. "Rehearsal Footage" (8:50 with "Play All" option, SD) comprises rehearsal footage of scenes involving Rahim, Adel Bencherif, and Gilles Cohen. Five "Screen Tests" (5:00, SD) of Tahar Rahim show how he won the lead role. Last up is the "Theatrical Trailer" (2:07, HD). All site content © 2000-2019 Peter Canavese. Page generated at 04/25/2019 02:46:36PM.